Our last recipe of puff pastry! This one is simple and elegant, nothing more than puff pastry and royal icing. Allumette translates to matchstick in English. And now we see how these pastries got their name, since they are indeed shaped like little sticks. Puff pastry is first topped with royal icing, then cut into rectangles, and baked. This recipe has you bake them under a rack, to ensure uniform puffing. Quite clever! The finished pastry is usually served with champagne, and would have been a nice finish to a romantic Valentine's Day dinner. Finally, a recipe that is easy! Just roll out the puff pastry, spread on the icing, cut, and bake. A little bit of freezing in between steps, so it takes some time, but the baking time itself is quick and gratifying. I followed all the directions, making sure to make clean and precise cuts. When I baked the pastry, I found it look a bit longer to get them golden brown. I added about 5-7 minutes on to the baking time. When I took them out of the oven, the royal icing on top had cracked and run off mostly. I wonder if it was too thin? I baked the first batch under the rack as directed, but the second batch I just used the cookie sheet alone. They seemed to also puff up equally, so I'm not sure the rack is necessary. Although these didn't turn out looking like the photo in the book, they are still delicious. The rich buttery pastry and the tangy lemony icing are good complements to each other. 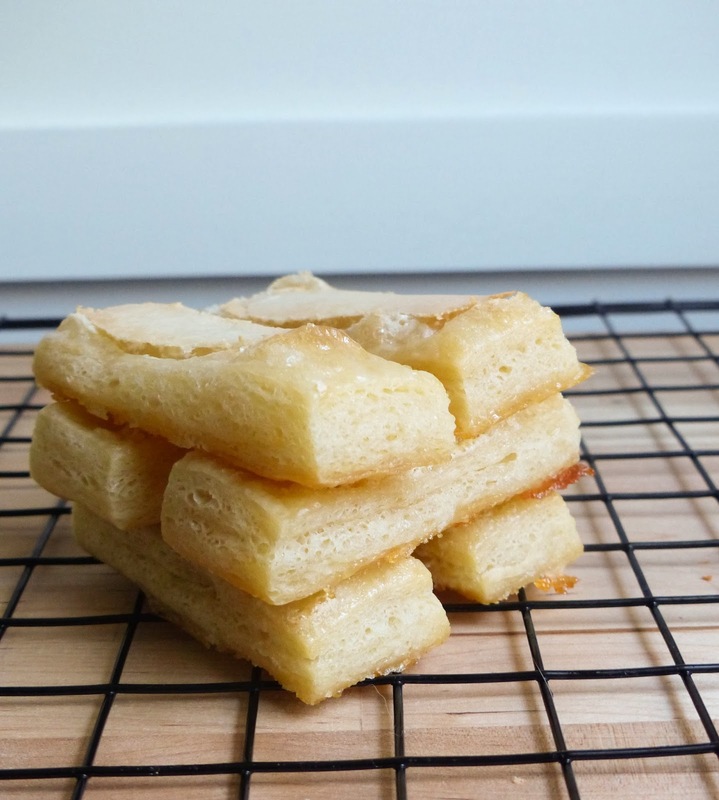 I like that you could make these with scraps from other puff pastry recipes. I've even seen savory versions, with parmesan cheese and herbs. Yum! Maybe I'll try that next, with my remaining half batch of puff pastry.